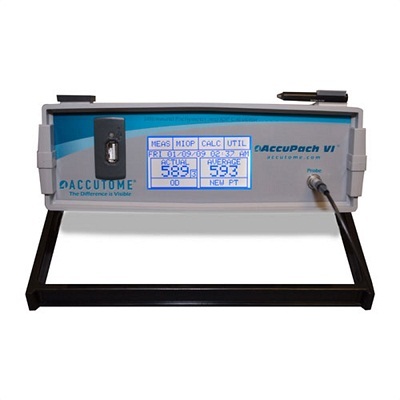 Easy to use User friendly touch tone screen allows the user to master the AccuPach VI in minutes. •Patients are #1 - Revolutionary voice output feature calls out readings, allowing the user to concentrate more on the cornea. •Superior Accuracy - State-of-the-art digital technology (Accutome's Digital Signal Analysis), combined with a probe sampling of 65 MHz, ensures precise readings. •USB Interface – Link to computer or printer via USB Memory Stick. •Confidence - Digital waveform analysis helps to ensure measurements are properly aligned. •IOP Correction Calculation - Converts IOP measurements in seconds. •Portable - The AccuPach VI is desktop, slit lamp or wall mountable. •Flexibility - Adjustable handle/stand allows viewing on different angles. Click the button below to add the Accutome Pach VI Pachymeter to your wish list.